All the problem Statements from various Government Authorities have been revealed. Please check out the "Themes" section. Keep checking this space for more updates! Train tickets upto the sleeper class (non tatkaal) will be reimbursed & free accommodation will be provided in the college hostels to all the selected teams. 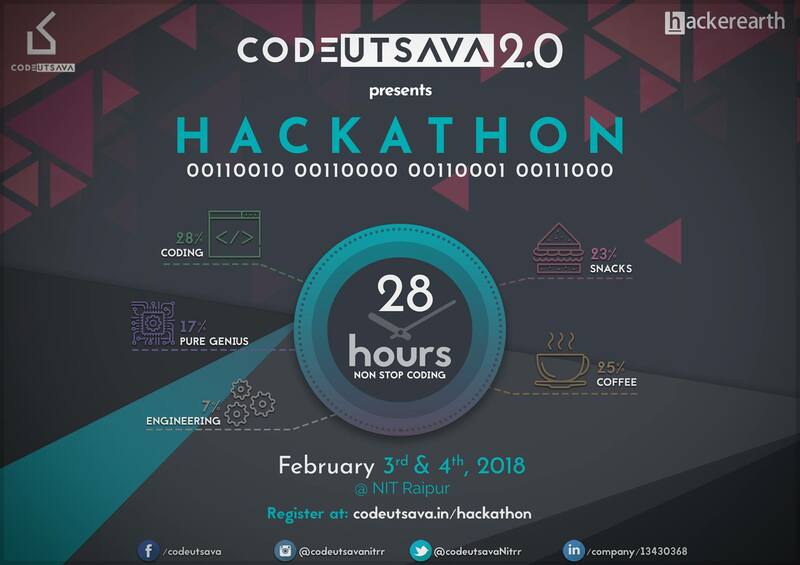 Presenting Central India’s largest computer science event, Codeutsava 2.0. It will be a two-day event comprising of expert talks and a 28-hour hackathon in the first weekend of February 2018. 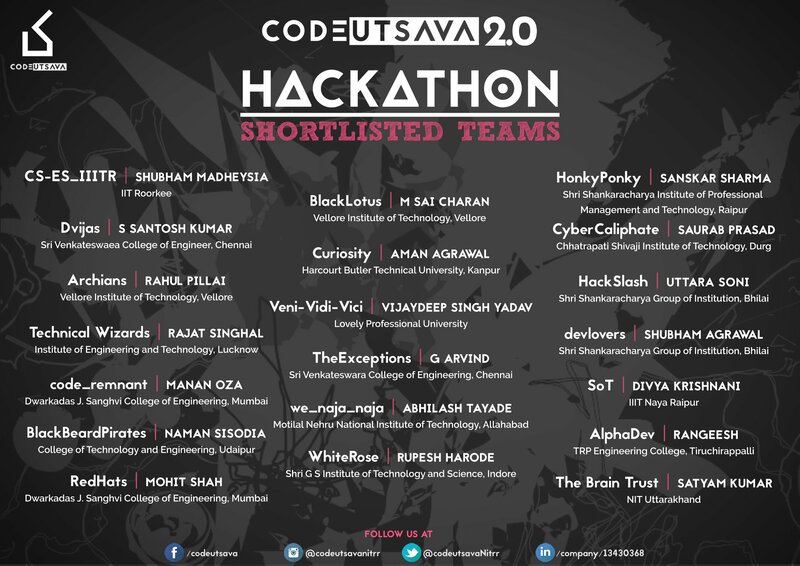 It aims at reaching out to the finest programmers and designers across India to transform their creative ideas into real working stuff and to benefit the technical community with exposure to newer technologies, current trends in the tech industry and the competition in this field. CodeUtsava 1.0 was a huge success & students from various colleges all over the country had participated. Held at February 4th-5th, there were 500+ registrations & 40+ teams in the onsite hackathon held at National Institute of Technology, Raipur. A series of workshops by distinguished personalities from various organisations like Facebook, Apple etc. were held. 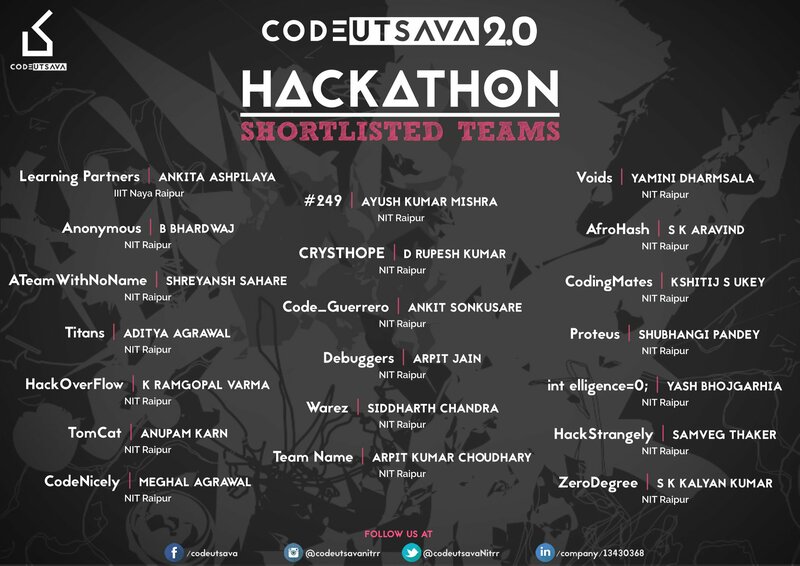 With that spirit, CodeUtsava 2.0 and invites all developers and hackathon enthusiasts to participate in an interesting and engaging hackathon. The products will be revolving around some themes, which will be revealed shortly. Please check the "Rules" tab for more details. No system for early identification of disability. Lack of tool for objective evaluation of percentage of disability in a person. We need an app which has a set of questions, by answering which early identification of disability can be done. We might need another app that helps a medical practitioner to conduct objective evaluation of disability percentage. Innovate and create new scenarios/cases for the same if possible. Customers are increasingly becoming online so are banks but we are still a long way from delivering a great online experience in banking. Today, customers are interacting with their money in different ways. Can the non banking community solve these challenges? Humans, around the world, commute millions of miles every single day. A significant fraction of our day is spent in traveling. Technology has played a very significant role in enabling more people to commute. Be it in the form discovery, aggregation or purchase, technology has redefined the way we commute. Imagine how technology can human experience even better in day to day transportation and commute. What can technology do make public and private transportation much simpler. A world of devices connected by internet opens up opportunities for us that were previously unthinkable. The fact that devices can now be connected to each other, share data and take intelligent decisions by talking to other devices can disrupt the way we interact with our surroundings. Build applications on Internet of Things that help us improve our experience in our day to day life. With the vision of Safe drinking water and sanitation facilities for all, at doorstep, at all times, WSSO intends to design and develop a state-of the art dynamic web-portal and an android app (optional). There are numerous hand pumps which supply drinking water across different blocks of different districts throughout the state. The main aim of the solution is to build an effective application through which we can ensure the quality/safety of drinking water coming from each hand pump. The quantity of various parameters like total arsenics, fluorides, iron, nitrates E-coli Bacteria in various hand pump in different part of the state will be collected from website - www.mdws.gov.in which is updated regularly. Check for provided permissible limits(refer to the table) of all the parameters present in the sample of drinking water obtained from a particular hand pump. If any parameter exceeds the permissible limit then web or mobile application/software will mark the location of the pump (obtained from the website). It sends the notification to nearest doctors, engineers, political leaders and stakeholders. It also tells the respective official about the harmful effects of the parameter which has exceeded the permissible limit. For a particular hand pump application will suggest the concerned officials what could be the steps they can take to eradicate the situation. After the officials receive the notifications, they carry on the work from their side and send the updates regarding maintenance and updated concentration to the server. Doctors, engineers, political leaders and stakeholders also update what actions they have taken in each step of the process. Completing this process, the app will ensure the quality of each hand pump present in the state. Target Beneficiaries being missed out and a lot of time is taken finding out the beneficiaries. At any point in time departments are not sure of the schemes and services that a person should be benefited with. For eg If the health dept has list of 100 pregnant women today they should know which all schemes and services she can enroll into. App should give list of all schemes that each person is eligible for. Get data from a department say health (all pregnant women as on date), run it through the eligibility criteria of various schemes and display the results. Results can then be used to get the scheme to the beneficiary. Create an app that maps all public toilets on Raipur (Chhattisgarh) on google maps and also has a profile for each public sanitation location. People should be able to review the toilets and that information should be available publicly. Utilize google maps for mapping. People can check-in, rate, review, submit feedback, etc. Also, the app should allow the star rating of public toilets and let users find the nearest toilet to their current location using the map. On the backend, collect review, rating and usage data. Time of review/rating can also be used to analyze usage patterns and time-of-day availability and utilization. This data can then be shared with concerned authorities to improve public sanitation and public facilities. In v2 of this app you can scale up and add all public toilets in Chhattisgarh and public facilities under various schemes. Like online shopping, now the farmers will be able to order farming related items(tools,equipments, raw materials etc) while sitting at their homes and get their orders delivered directly to their home in remote areas without paying any extra charges for this. It should also have a section which keeps the user updated about the current agricultural news & the schemes provided by the Government. It should also have features of area wise detection of the user to give them different agricultural advices and tips. A section which informs the user about the benefits of organic farming, a discussion forum in which users can post queries regarding farming, integrated with the NACOF representatives so that they can answer those. The whole UI and workflow of the app should be clear & sufficient enough for a rural farmer to understand completely as well.